A recent article published by the Eastern Daily Press put a positively spotlight on the work of journalist Rebecca Atkinson for her campaign in driving toys with more diversity including figures with disabilities. 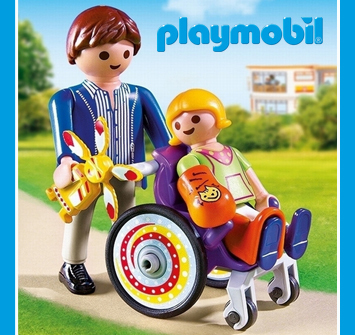 Playmobil were one of the brands acknowledged in the press coverage for its range of toys which includes a child in a wheelchair within its City Life collection. The Guardian, who also looked into the under representation of toys with disabilities quoted that there were approximately 150 million children globally living with disabilities in 2016, yet their positive inclusion and acknowledgement through toys almost non-existent. Research has always supported the role that toys play in the physical and mental development of children and in modern times more emphasis in being placed on how they influence their outlook of the world. By introducing toys in a range of ethnicity and physical appearance, kids are said to be more likely to be accepting differences in the real world as a norm. Of course, they are also fundamentally reassuring to kids who have disabilities too by demonstrating their equal worth in society and by allowing them to associate themselves with the toys and interact at the same stance with their other figure toys just the same. Playmobil toys are available from leading wholesaler Baby Brands Direct and include the above figure child in a wheelchair, alongside many other toys from the City Life collection, rescue services, fantasy and more. The toy brand was established in the mid 1970s and developed to fit into a child’s hand and be durable and firm, whilst having flexible parts to support imaginative play. The range has significantly grown over the years with not only children buying the products but also collectors! This Summer will also see the launch of the brand’s first movie, with the exclusively developed toys likely to see sales soar! Log in now to review trade prices for Playmobil figures and playsets and place orders with a quick lead time. You can also review the range in our online catalogue and if you are not an account holder and wish to become a stockist then please apply for an account here.